This unique, handy little gage is great for use in sensing the temperature of almost any surface. The bimetal sensing element is exposed to allow quick accurate response to surface temperature, but adequately shielded from damage by a protective cover and heat collector. For the most accurate reading this surface thermometer should be used in still air. Place the gage on the surface where you wish to know the temperature – dial face up with bimetal sensing element against the surface. The magnets will allow placement in any position on a ferrous surface. It can also be used on any other material with a horizontal surface. 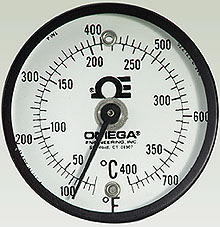 Allow about a minute for the sensing element to stabilize and then read the temperature. Higher or lower air temperatures surrounding the thermometer or a draft over the surface may slightly affect the temperature indicated. Air ducts, boilers, cabinets, drums, engines, enclosures, fire boxes, manifolds, platens, plumbing, piping, refrigerators and many others.